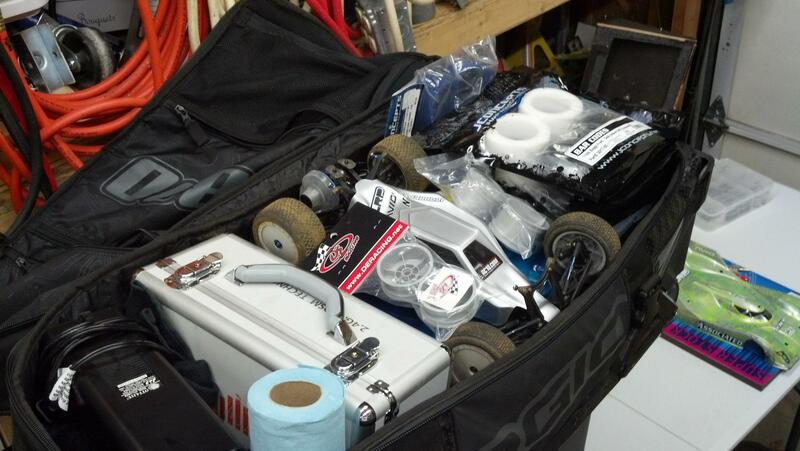 Anyone have pics of an OGIO bag stuffed full of RC stuff ready for race day? I'm interested to see how much stuff will fit in there and in what manner. Right now I've got a traditional hauler bag with drawers for all my stuff like parts boxes, tires, soldering station, charger and batteries. Curious to see how that type of stuff fits in the OGIO bag. Yeah, thanks. I already did the search and read the threads. We're not talking a huge difference here. Just for a 6 pack its 122. Anyways the ogio, its good for lugging around but access to it is not so good. You gotta unpack everything on the pit table. A tackle box and those avro mills boxes work better for me. Had a hauler bag before that as well. Nice - thank you. That give me a better idea. Anyways the ogio, its good for lugging around but access to it is not so good. You gotta unpack everything on the pit table. I paid $189 for mine on Amazon about four months ago. Best bag I've ever had. Best constructed, most functional, best value. I can get my transmitter, three sedans, and everything I need at the track for a race day in it no sweat. Just for a 6 pack its 122. Anyways the ogio, its good for lugging around but access to it is not so good. You gotta unpack everything on the pit table. . I don't mind that part one bit. At least for me, it's far faster and more efficient than when I had a Venom bag. Certainly it's easier to load. Dont do it !!!! get the OGIO 9800. Great construction, a stupid amount of space, they are stylish andthey have a lifetime warranty(what other bag has a lifetime warranty?) I have a 25 ft ex. cord, a fan, my HiTec X4 box, 2 plano double lid storage thingys, ott lite box, Dialed fluid bag, tires and misc items filling up the gaps and a T4.2 and thats only the main section. Best purchase i have made in a long time doNOT let the price and lack of drawers scare you away. All times are GMT -7. It is currently 10:16 PM.